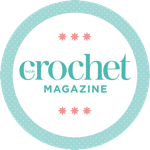 Crochet is a wonderful way to embellish a high street sweater, creating a garment as unique and beautiful as your imagination. Any similar weight mercerised cotton could be used to achieve a similar effect. Tracey Todhunter is a knitwear and crochet designer specialising in homewares and small accessories. Visit her website at www.grannycoolcrochet.com for free patterns and details of workshops or follow her on Instagram @traceytodhunter for current projects and design inspiration. Want to leave a comment on this pattern? Please login below, or register. Sorry, there have been no comments on this pattern yet - why not be the first to leave your opinion?